Every Sunday we gather across three services. 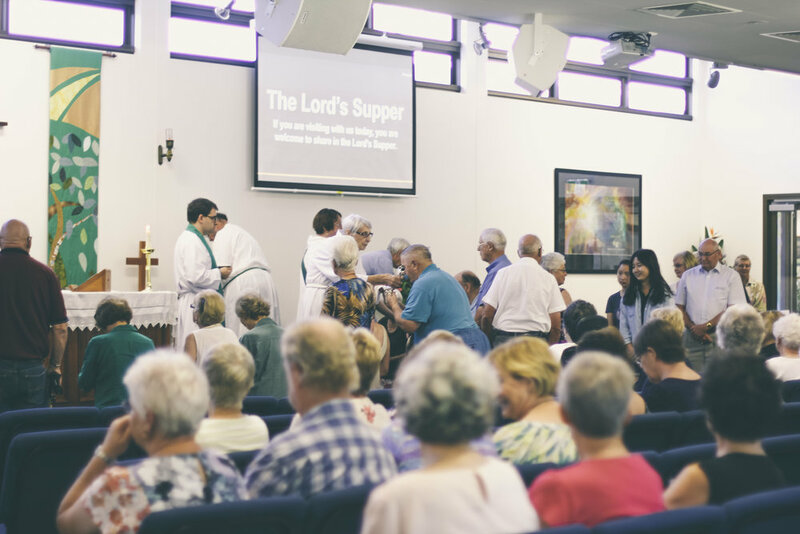 Around 130 adults gather each Sunday for this traditional yet lively service at 7.30am. This Communion service draws on the richness of our Anglican heritage, expository preaching, and a mix of ancient and modern hymns (with music provided by a small band). Transportation is available each week for those unable to drive, with prayer also offered after each service. Each service is also followed by a friendly morning tea looking out on our beautiful grounds. Our auditorium is air-conditioned (cooled in summer, heated in winter) and audio lanyards are available for those with hearing aids. Around 150 adults and 60 children gather for a multi-age service with a contemporary worship style, expository preaching, and fantastic children’s ministry. Our St Bart’s Kids team provide an amazing crèche as well as junior and senior Sunday Schools. Each service includes a Children’s Talk and an alignment between the children’s and adult’s content. There is also a discussion group for High School-aged young adults. Prayer is available after the service along with espresso coffee and a delicious morning tea. A playground and fenced play area is also available for children outside. A contemporary and relaxed service, especially for the younger at heart. Each Sunday night we gather to worship with great music, an emphasis on teaching, and a genuine desire to grow as a missional community. New people are always welcome and we would love you to join us for dinner on site or out in Toowoomba. We also celebrate the Lord’s Supper twice per month, giving great thanks to God for Jesus and all that he has done for us and the world. If you’re new to Christianity or have lots of questions, then this is a great community to connect with. Thursday Holy Communion at 7AM. Each Thursday a small group of people gather to share in the Lord's Supper, discuss some Bible readings, and pray for the world and for the church. This is a relaxed service and intimate service meeting in the prayer room at the back of the church auditorium. Anyone is welcome to join us. Weddings. We would be delighted to be part of your wedding day. For more information, please contact the church office. Baptisms. Congratulations on two accounts. First on the birth of your baby. We trust these early days are going well. Second, on choose to mark your child’s birth with a significant church ceremony. For more information, please contact the church office. Funerals. In most cases the funeral director will contact the church at the request of the family to arrange a funeral. The funeral will be conducted either at the church or at the local funeral directors chapel dependent upon requirements. For more information, please contact the church office. All services take place at St Bart’s: 103 Stenner Street, Rangeville (up towards Rowbotham Street).